Amanda Hesser, food columnist at the New York Times for more than a decade and author of The Essential New York Times Cookbook (winner of the 2011 James Beard Foundation Award in General Cooking), has much to say on the subject. Hesser is quoted as saying in an interview on WNYC’s Leonard Lopate Show: “I’ve thought a lot about why this torte struck such a chord with people: the answer, I think, is that it’s a nearly perfect recipe.” She reasons its popularity may be because there are only eight ingredients, four short steps, and the cook needs no special equipment; just a bowl, spoon and pan. 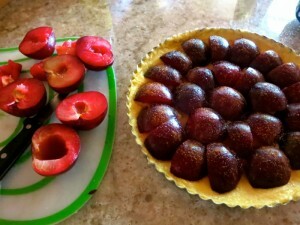 She describes the finished product as “…crusty and light with deep wells of slackened, sugar-glazed fruit.” As well, baked plums are sweet and tart, making the flavor more complex than a “….hard-hitting sweet dessert”. Hesser notes that the torte also freezes well; triple the recipe and you’ll be one happy camper when the curtain falls on plum season. Interestingly, Hesser writes that of the top five most-recommended recipes by The Times readership, four were desserts, and four were more than 20 years old, all of which are included in her cookbook. What better time to try this simple recipe than now, with plums coming into their own at markets across town. Plums are the juiciest of the stone fruits, and you’ll want to use plums that are ready-to-eat and sweet. You’ll know a plum is at the pinnacle of perfection if you press it gently and it yields to pressure. Avoid plums that are rock-hard, shriveled, have brown spots or broken skin. A plum is best when ripened on the vine, but slightly firm plums are OK to purchase, and may be ripened on a counter, stem-side down, in a single layer. Plums come in many varieties, shapes and colors and I imagine any plum that’s lush and sweet would be perfect in the following recipe, but the purple and red varieties (in my opinion) would yield the most beautiful result. My plums were larger than those used in the original recipe, so I quartered, rather than halved them. Certainly plums are also divine eaten simply out of hand, but also consider serving them with buttery cheeses, such as a triple-cream Saint Andre with toasted nuts on the side; or grill them, halved and pitted flesh side down, alongside chicken or duck breasts. You’ll be hard pressed to find a more simple, yet complex and rich sauce to complement the poultry. 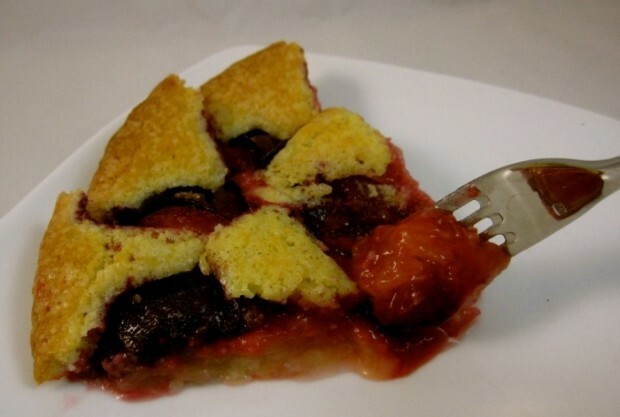 I enjoyed the airy, yet cakey, crisp topping on the cake; a marvelous encasement for the plums with their luscious, jammy flesh oozing into the pastry, in pleasant contrast to the tart texture of the skin. I’m used to the German, structural style of plum tortes with a dense, more yeasty crust, and this was a delicious variation. I considered bolstering the pastry crust with the addition of finely chopped nuts, to give it more substance, or seasoning the pitted plums with grated nutmeg, orange zest, cardamom or a liquor. But as in Japanese haiku verse, the root of this recipe’s magnificence lies in its simplicity. Cream sugar and butter in a bowl. 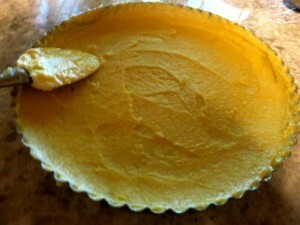 Add flour, baking powder, salt and eggs, and beat well. Spoon the batter into a spring form of 8, 9 or 10 inches. Place the plum halves skin side up on top of the batter. Sprinkle lightly with sugar, depending on the sweetness of the fruit. Sprinkle with about 1 teaspoon of cinnamon, or to taste. Bake on middle rack of oven for 40 to 50 minutes. Remove and cool; refrigerate or freeze if desired (but first, double-wrap the tortes in foil, place in a plastic bag, and seal). Or cool to lukewarm, and serve.